SEO And Social Media Marketing? 3 years back, the best solution to get a better ranking for your website was achieved by integrating right SEO techniques onto your webpages. Good ranking on search engines was the only solution to generate traffic. This gave rise to various Search Engine Optimization companies and specialists, even web hosting companies bundled SEO services as a part of their offering. However, today the times have changed and Social media is new and indeed a promising media. 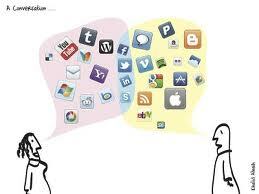 Social media is comprised of multiple social networking sites. Today every segment has its own dedicated social networking site. For example, if you are a photographer then Flickr is option for you, for video – Youtube and Vimeo are popular. For business professionals, LinkedIn and Xing are powerful networking tools. And not to forget, today Facebook is the king of all social networking sites. With social media you have the option to reach your target audience in a shorter time. Social media is all about action, interaction and feedback. Social Media platforms have a visual appeal attached to them and hence they got popular so soon. Search engines have understood the importance of social media and hence you will notice that for every keyword that you search, the search result page also includes entries from social networking sites. This rightly gives us an indication that for successful online business, social media marketing is also important. Depending upon your business segment, make a list of suitable social networking sites. Spare some time and read about these networking sites and try to understand how it works. Create an account and make sure that your profile is at least 95% complete. Listen to what people are talking. Try to understand the overall mood and discussion topics. Make a note of most popular topics, being discussed on these sites. Think about how you can contribute to these topics. Do some research on points that you plan to discuss with the members on the social networking site. Make sure that you have the most updated information and also how it could help fellow members when you share it with them. Once you start sharing your views, people might start questing you or ask for your suggestions. Be prepared to answer them. Give references, examples to validate your points and opinion. By the means of above 5 steps, you have tried to create a niche for yourself and your business amongst your target audience. This will help spread awareness about you and your business. This is just the first step, and the journey ahead is truly promising provided you are on the right track. Before it gets too late, make sure you get your hands on Social media marketing. Its indeed a new media – but a truly promising media.